Sender's Name, Sender's title, department, and library, [(email address for private use)] to Member's name, email, "date of email", "Subject Line of email," "where you have stored the mail"; privately held by [[WikiTree ID|Member's Surname]], Member's city and state. Jane Doe, Research Specialist, Government and Heritage Library, North Carolina Department of Natural and Cultural Resources, [(email address for private use)] to Debi Hoag, email, 31 February 2012, "Reed Gold Nugget location," Smith Family Files, Shinn Folder; Privately held by [[McGee-1611|Hoag]], Leesburg, Florida. The [(email address for private use)] portion is used because Jane Doe did not give permission to share her email address. If she had, it would be located in that place in parenthesis like this (JDoe@madeup.com). The square brackets, used to indicate that it is a note written by the member, would not be included. ; privately held by Hoag [(email address), & street address for private use], Leesburg, Florida. This citation example was crafted using Elizabeth Shown Mills' Evidence Explained, 3rd Edition Kindle, pg 154-155, 3.42 "E-Mail & Instant Messages > E-Mail > First Reference Note." I'll add a a separate line on the spreadsheet for you, Katie. If you want a chance for the weekly winner sticker, you will need to register each Friday when I post the Sprint thread. Glad to have you joining us again, Sarah. Good Luck! Congratulations, Sarah! 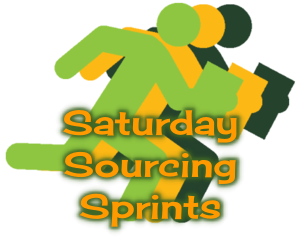 Thanks for sourcing the most profiles in this week's Saturday Sourcing Sprint. Amazing how easy it is to make a total mess of things. I applaud your efforts to fix the chaos! Thanks for filling in the rabbit holes, Michelle. Let us know if we need to send a search party in to bring you back to the service. Been going 7 hours now, and nearly completed that one family..complicated by duplicates that need merging, and closed profiles that really could do with being open! Wow! From a Smith family researcher, my thanks! Are the profiles managed or orphans? If they are orphaned and the connected relationships are all for deceased people, send the team a message asking if they can be opened. I was able to get some that I worked on opened up after adding evidence on all the linked profiles. Hope my SMITH family are better connected than this one even if it does have a lot of Ancestry sources attached. nearly 12 hours solid and I'm running out of steam lol It started off as a "Smith" but when I researched the family, half the women had been given the surname "x" instead of "unknown", and the other half had the wrong LNAB. No dates or places on any of the profiles but I figured them out, now all sourced with dates of birth's and places of births! and I haven't a clue whether Caroline Howard should be Pratt or Goodchild but it certainly isn't Howard! She is a strange one - father recorded as Thomas Pratt on marriage, with a Goodchild witness, then in census she has James Goodchild as her father. She was living with James & Martha Goodchild, and there is a Caroline Goodchild, daughter of a James & Martha Goodchild baptised....my brain is too frazzled to work that one out at the moment. i think I have corrected and sourced about 60 ancestors of one person today! Doh...I worked out Caroline...James Goodchild married Martha Pratt (widow) in 1835, Caroline was born in 1827! I knew I'd solve it eventually! And I found her baptism...threw me because she was born in 1828 in Islington but baptised in 1836 in Lambeth! Those late baptisms can be confusing especially when the mother has remarried in the meantime. Glad to see you join us again, Kyla. Good luck! I'll work on some Pennsylvania profiles tomorrow. Good luck in Pennsylvania, Beverly. Thanks! Michelle was a jinx with her mention of rabbit holes. The first profile I selected to source was an infant - whose entire family was unsourced or unidentified. If there is no profile for a father, but I find his identity on the source for the child, I cannot resist creating a profile for him - and oh, yeah, there are some records for him as well. And the next thing you know that still-born child teased me down a rabbit hole for hours! Thankfully my dog did her "begging beagle" routine with the big soulful eyes to remind me that we were late for sharing lunch. Whew! I find if I've worked out a really complicated relationship, I like to add in the profiles of other relatives as they may not be easy for others to work out. Welcome to the Sprints, Kandita. Good luck and let us know if you have any questions. I will be working on some of my profiles which only had local file references. The online sources have improved since I uploaded my Gedcom file. Sounds like a great plan, Hilary. Good luck! I should probably follow suit with my sources that were emails from a cousin, etc. Didn't get very far with them been cleaning up some sources and found a surname for an unknown spouse. Good to see you, Navarro! Good luck. I'm up and almost ready to start. Good luck today, Beverly. Thanks!